There’s no reason to exist solely on granola and dried fruit when you’re in the great outdoors. A useful gift for anyone who loves extended visits to nature’s five-star experience! 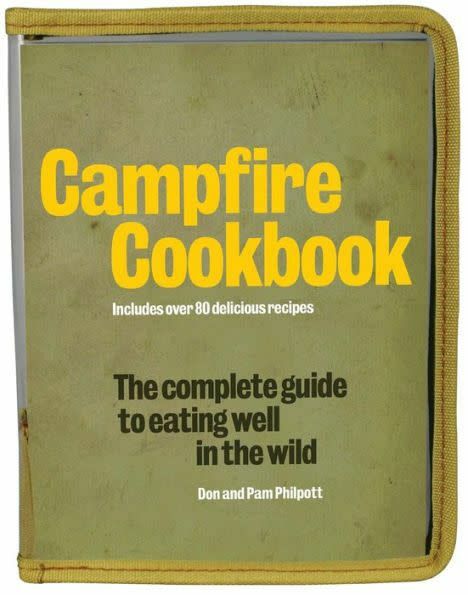 Campfire Cookbook offers guidance on the types of ingredients and how much food to pack, survival techniques if you run into trouble, and recipes for trailside culinary delights such as banana pancakes, quiche, omelets, stir-fry, pasta, soups, and stews. Muffins and bread are also covered, along with advice on using a Dutch oven to bake in the campfire. Beverages and desserts round out the wild cuisine. Don Philpott and Pam Philpott live in Florida and between them they have written more than 55 books on food, drink, and travel. Don Philpott spent 35 years traveling the world, first as a journalist and then as a travel writer. He is the co-founder of Footloose, an outdoor activities magazine in his native Britain. He has backpacked, climbed, canoed, ridden, and skied throughout Europe, North America, Africa, Australia, and New Zealand.